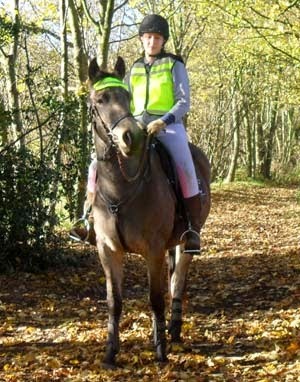 Solution Saddles Customer Stories: Laura Morrish - Confident A SMART GP Offers The Best Start For Her Youngster Buddy. Laura Morrish - Confident A SMART GP Offers The Best Start For Her Youngster Buddy. After reading about treeless saddles and the benefits for the horse, I wanted to find one for my horses. My old mare had a lot of back issues, many of which I think could have been avoided if I had had a properly fitting saddle when she was younger. I decided on a cheaper make of treeless saddle at first and noticed a difference in all the horses I used it on. It was certainly doing them good and they were moving much more freely, but it did not suit all the horses I rode. It felt unstable, slipping easily from side to side because there was a lot of padding under the saddle. I felt further away from the horse than in a traditional saddle, and at times, quite unbalanced. My horse’s health and comfort is hugely important to me. I ride a lot of young horses and some problem horses so, in the long term, these were going to be issues. I couldn’t afford to be worrying about the saddle slipping and I wanted my youngster to have the best possible start.. I first saw Solution Saddles at Horse of the Year Show 2012, where I sat in a SMART saddle. I was very pleased by its looks and comfortable feel. It looks just like a traditional treed saddle but as demonstrated to me, the RigidFree system means it freely moves and flexes with the horses shape. I booked a home consultation visit to test ride the SMART saddle. When the Approved Advisor came out she went through all of the information on fitting and using the saddle that I needed to know. I felt completely secure, so was able to focus on riding my youngster rather than thinking about the saddle. I ordered my SMART GP saddle straight away! Pictured above, Buddy and I the day after receiving our new SMART saddle. This was our first ever hack and just the 6th time he has been sat on. 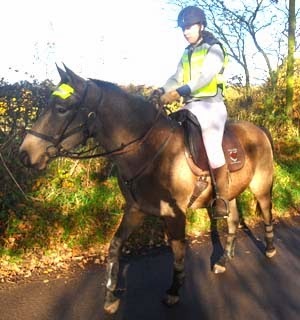 I felt comfortable and secure in the SMART GP saddle straight away, and we had a lovely ride. I'm confident that the SMART GP saddle is the best start I can give my young horse and can't wait to get back in the saddle again!